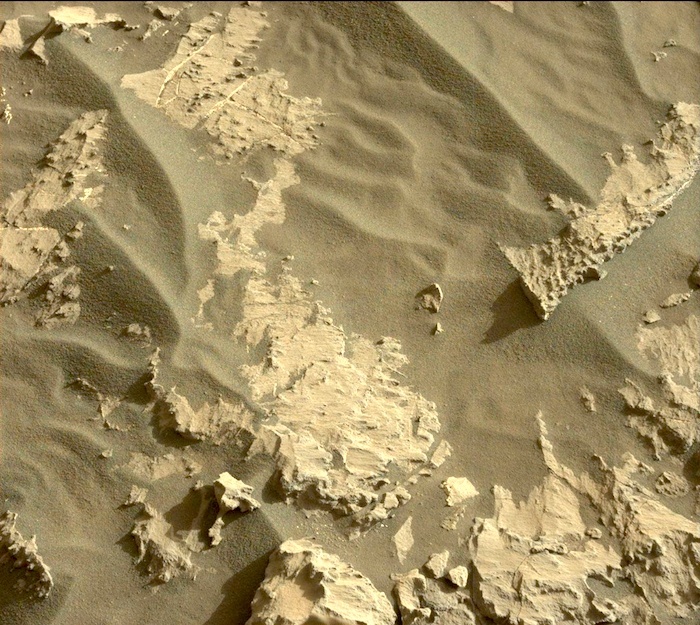 This image was taken by Mastcam: Left (MAST_LEFT) onboard NASA's Mars rover Curiosity on Sol 1174 (2015-11-25 10:04:13 UTC). 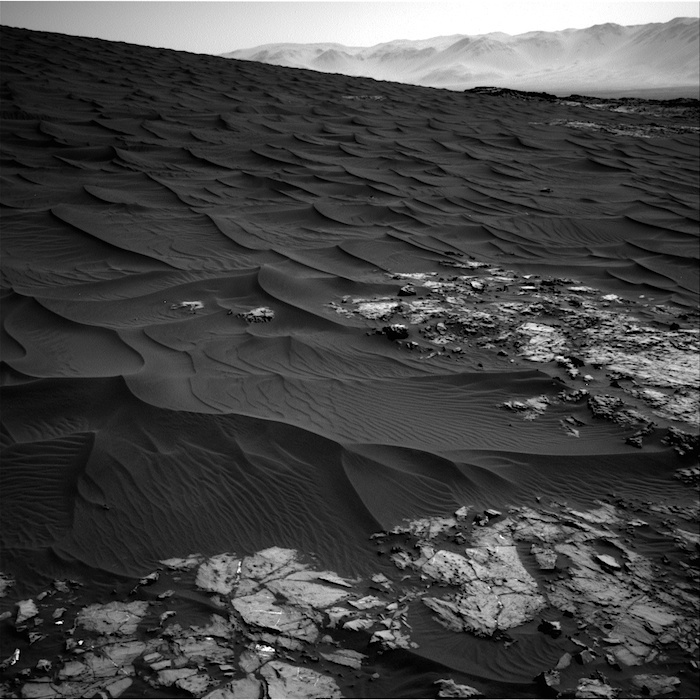 This image was taken by Mastcam: Left (MAST_LEFT) onboard NASA's Mars rover Curiosity on Sol 1174 (2015-11-25 10:44:52 UTC). 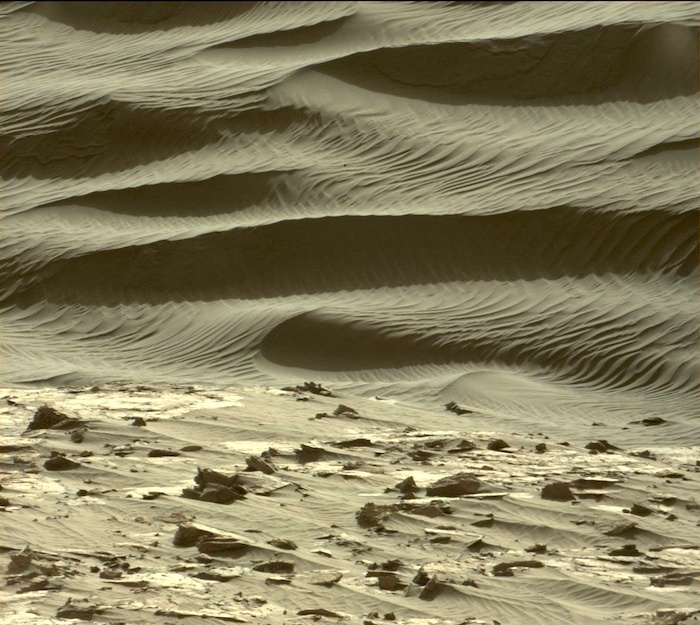 This image was taken by Mastcam: Right (MAST_RIGHT) onboard NASA's Mars rover Curiosity on Sol 1174 (2015-11-25 11:04:37 UTC). 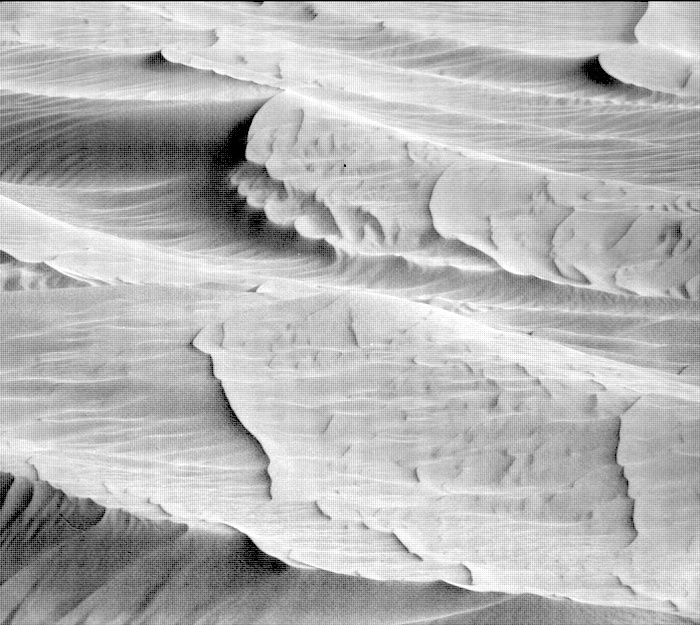 This image was taken by ChemCam: Remote Micro-Imager (CHEMCAM_RMI) onboard NASA's Mars rover Curiosity on Sol 1174 (2015-11-25 09:06:25 UTC). 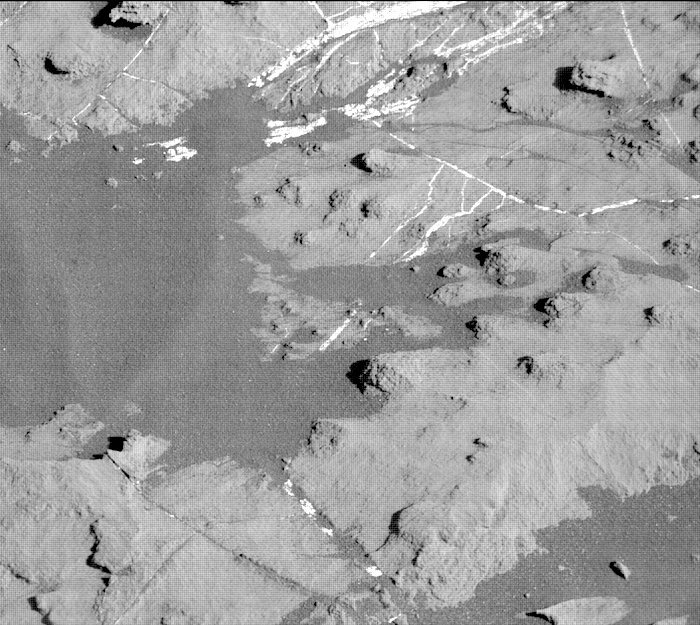 This image was taken by Navcam: Right B (NAV_RIGHT_B) onboard NASA's Mars rover Curiosity on Sol 1174 (2015-11-25 10:51:45 UTC). 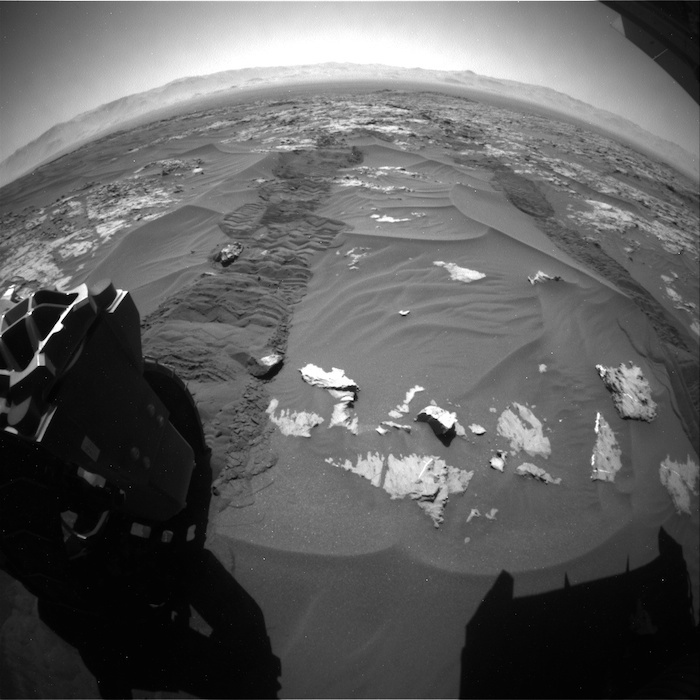 This image was taken by Navcam: Right B (NAV_RIGHT_B) onboard NASA's Mars rover Curiosity on Sol 1174 (2015-11-25 10:47:58 UTC). 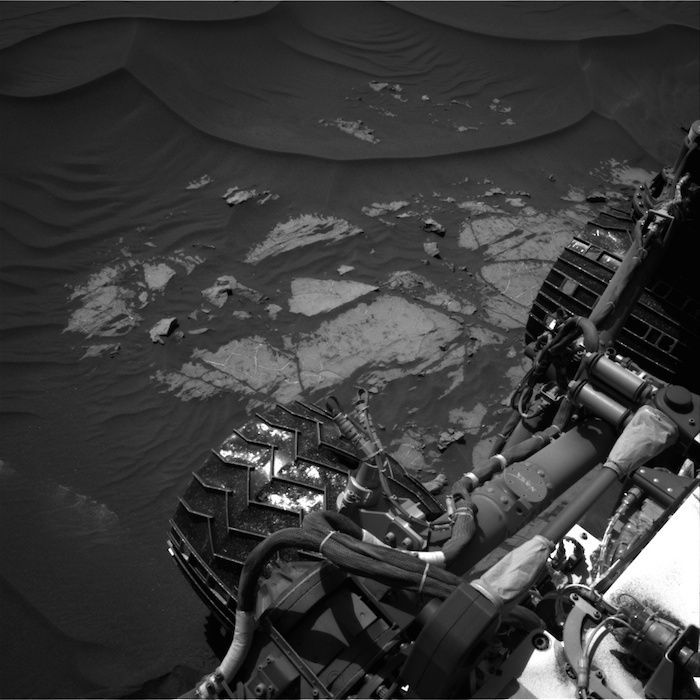 This image was taken by Navcam: Left B (NAV_LEFT_B) onboard NASA's Mars rover Curiosity on Sol 1174 (2015-11-25 10:54:41 UTC). 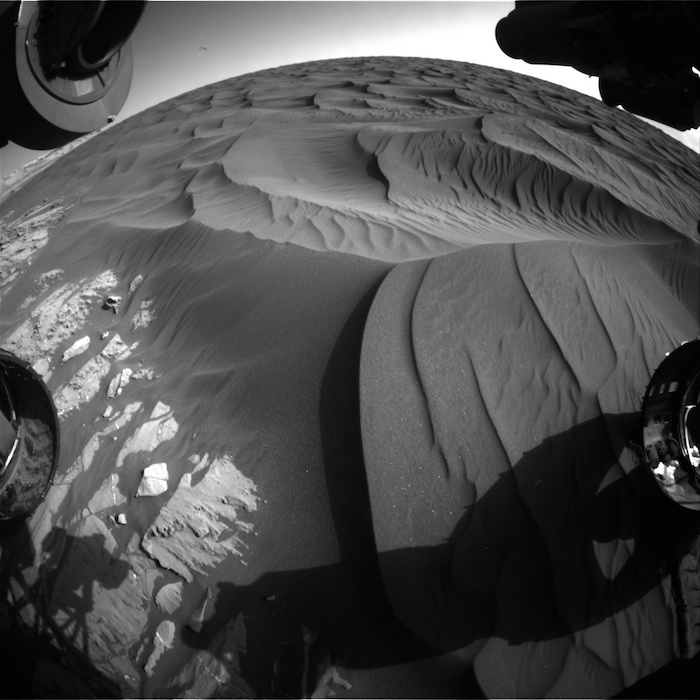 This image was taken by Rear Hazcam: Left B (RHAZ_LEFT_B) onboard NASA's Mars rover Curiosity on Sol 1175 (2015-11-26 09:02:10 UTC). 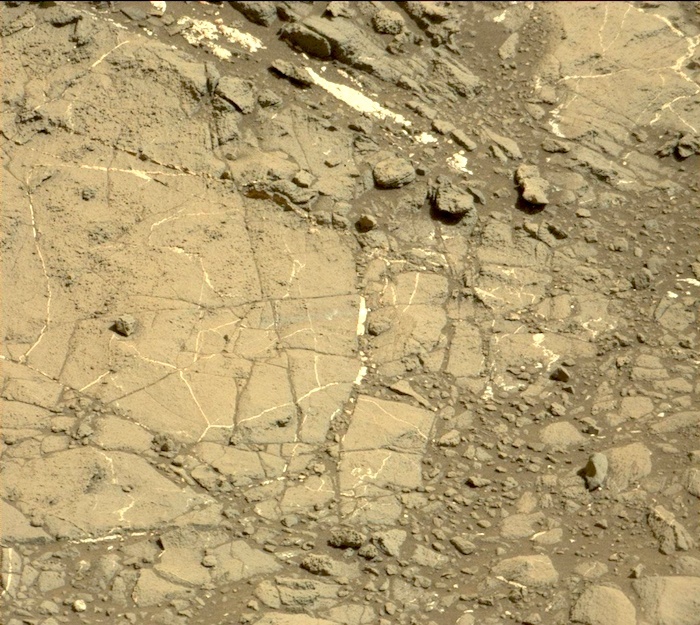 This image was taken by Mastcam: Right (MAST_RIGHT) onboard NASA's Mars rover Curiosity on Sol 1176 (2015-11-27 13:08:22 UTC). 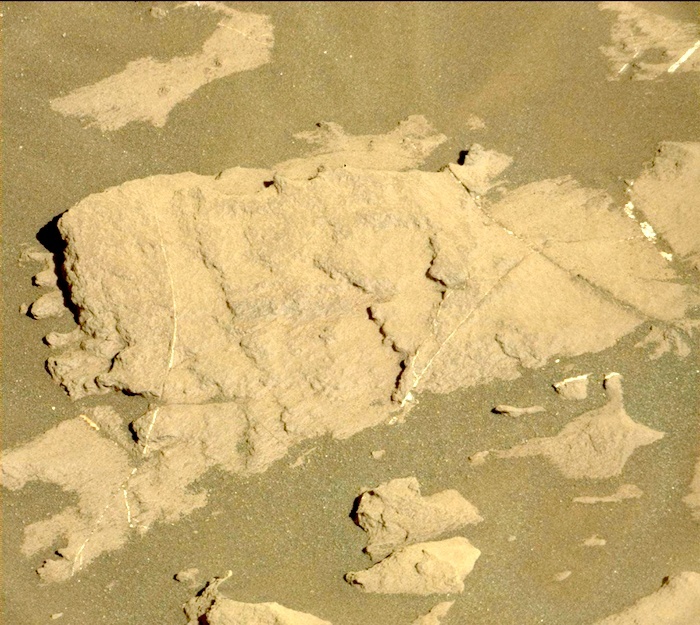 This image was taken by Mastcam: Right (MAST_RIGHT) onboard NASA's Mars rover Curiosity on Sol 1176 (2015-11-27 13:14:21 UTC). 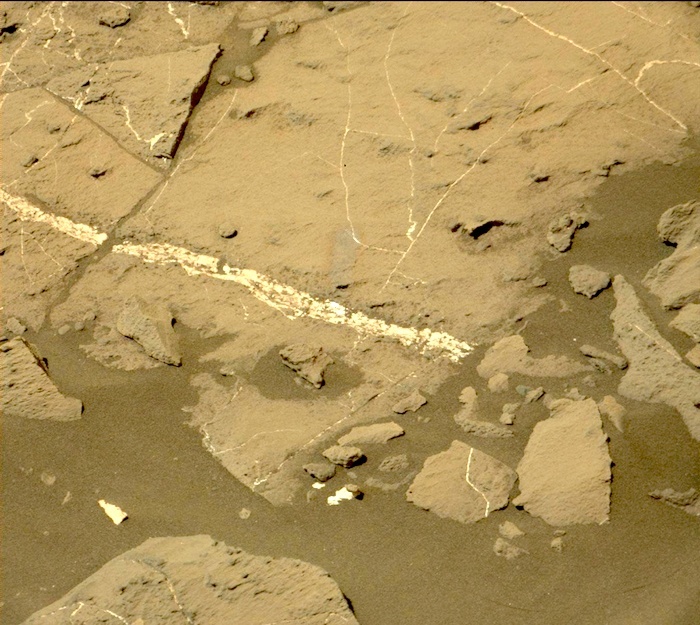 This image was taken by Mastcam: Left (MAST_LEFT) onboard NASA's Mars rover Curiosity on Sol 1176 (2015-11-27 14:11:25 UTC). 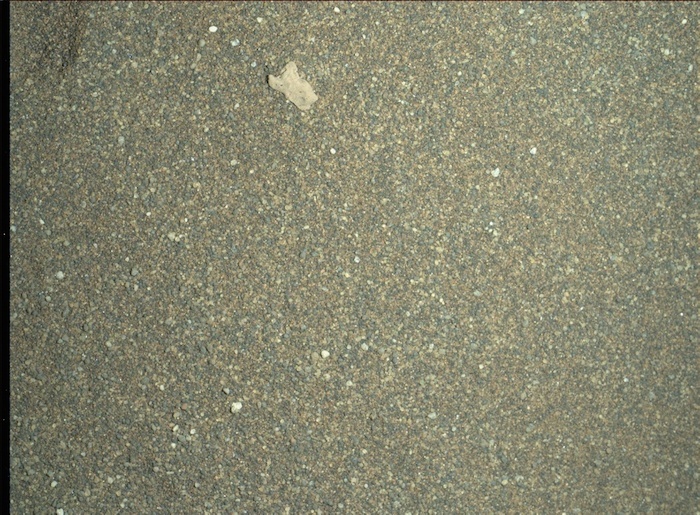 This image was taken by Front Hazcam: Right B (FHAZ_RIGHT_B) onboard NASA's Mars rover Curiosity on Sol 1176 (2015-11-27 13:01:50 UTC). 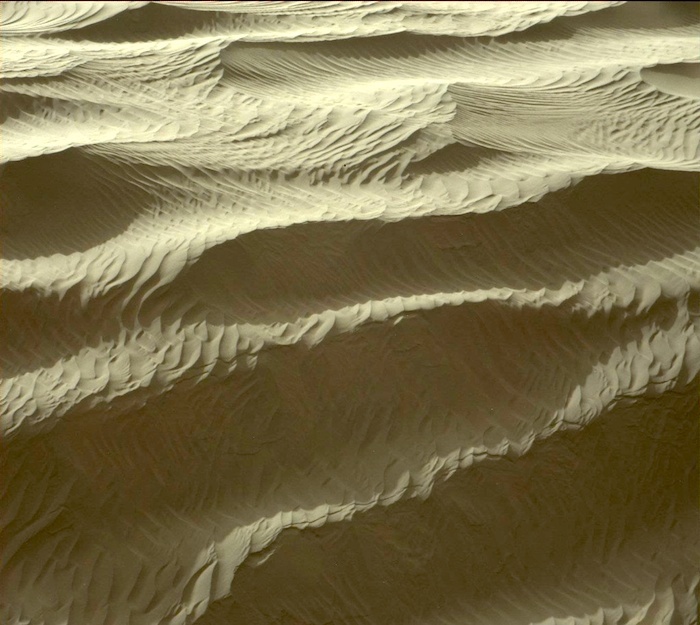 This image was taken by Mastcam: Right (MAST_RIGHT) onboard NASA's Mars rover Curiosity on Sol 1177 (2015-11-28 12:00:15 UTC). 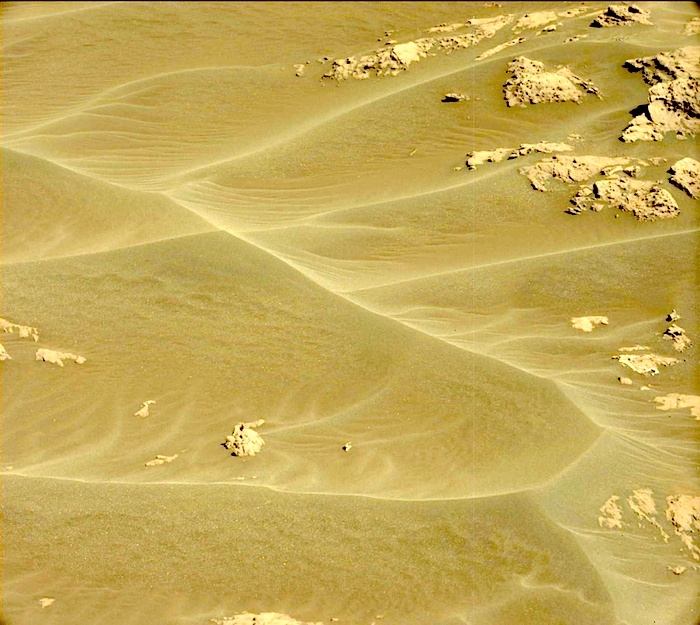 This image was taken by Mastcam: Left (MAST_LEFT) onboard NASA's Mars rover Curiosity on Sol 1178 (2015-11-29 14:58:15 UTC). 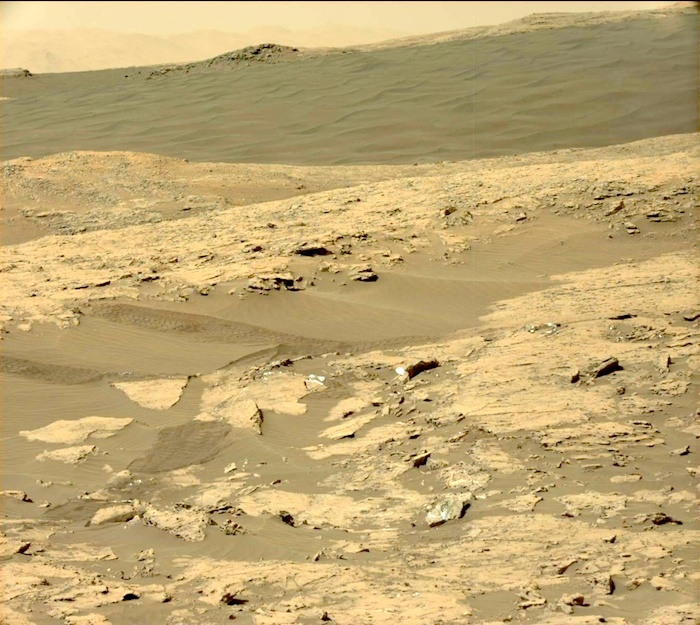 This image was taken by Mastcam: Left (MAST_LEFT) onboard NASA's Mars rover Curiosity on Sol 1179 (2015-11-30 14:05:42 UTC). 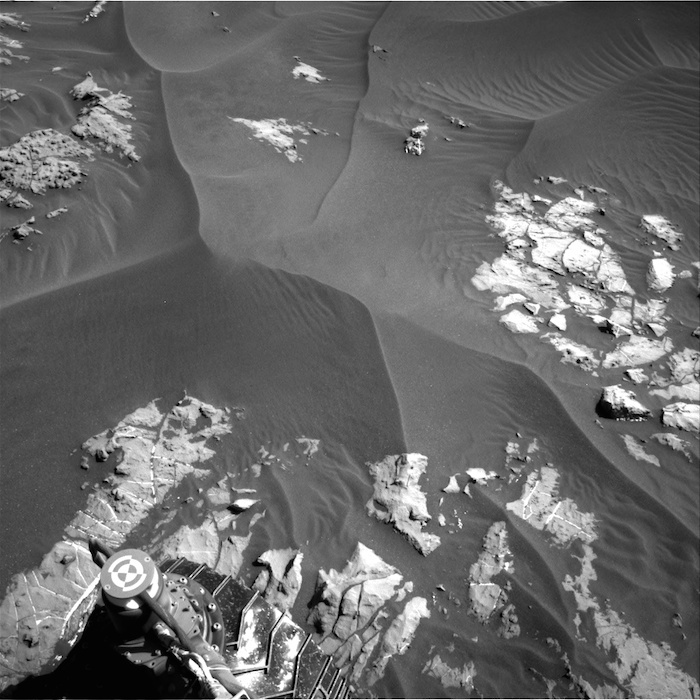 This image was taken by Navcam: Right B (NAV_RIGHT_B) onboard NASA's Mars rover Curiosity on Sol 1179 (2015-11-30 14:10:35 UTC). 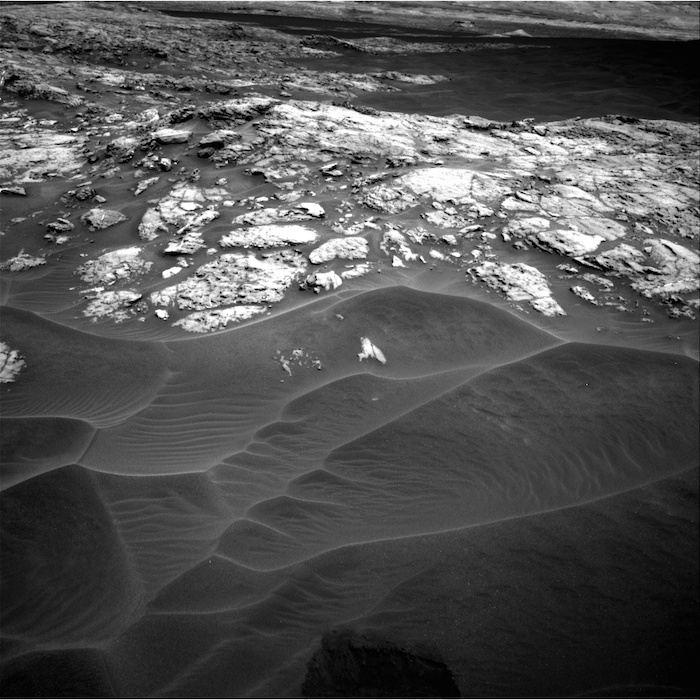 This image was taken by Mars Descent Imager (MARDI) onboard NASA's Mars rover Curiosity on Sol 1181 (2015-12-02 19:38:17 UTC). 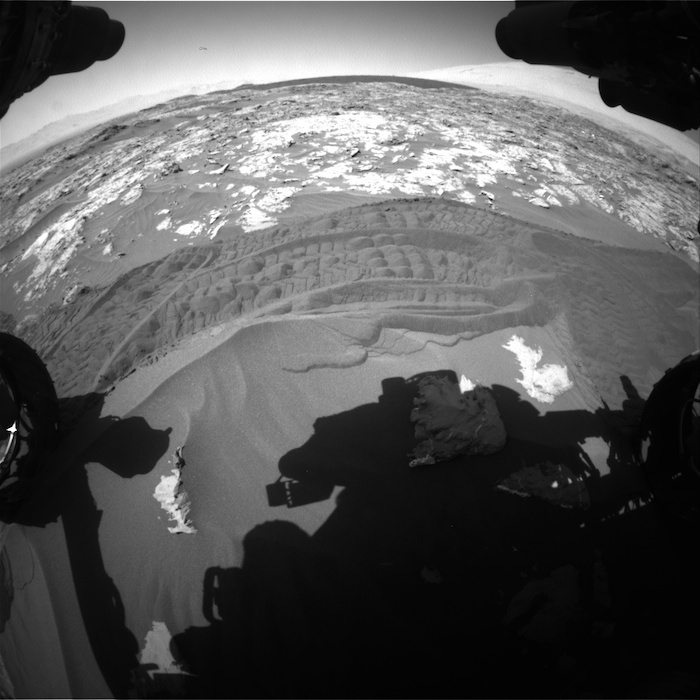 This image was taken by Navcam: Right B (NAV_RIGHT_B) onboard NASA's Mars rover Curiosity on Sol 1181 (2015-12-02 14:35:03 UTC). 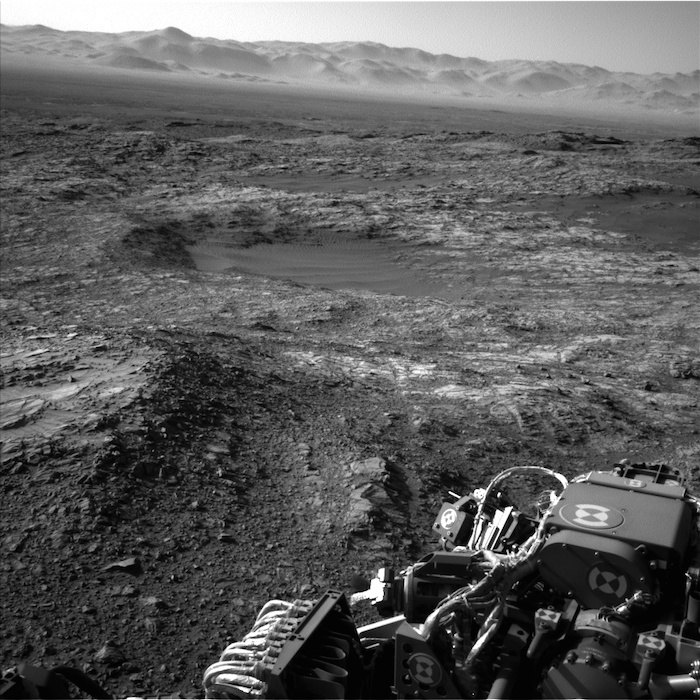 This image was taken by Navcam: Right B (NAV_RIGHT_B) onboard NASA's Mars rover Curiosity on Sol 1181 (2015-12-02 14:47:25 UTC). 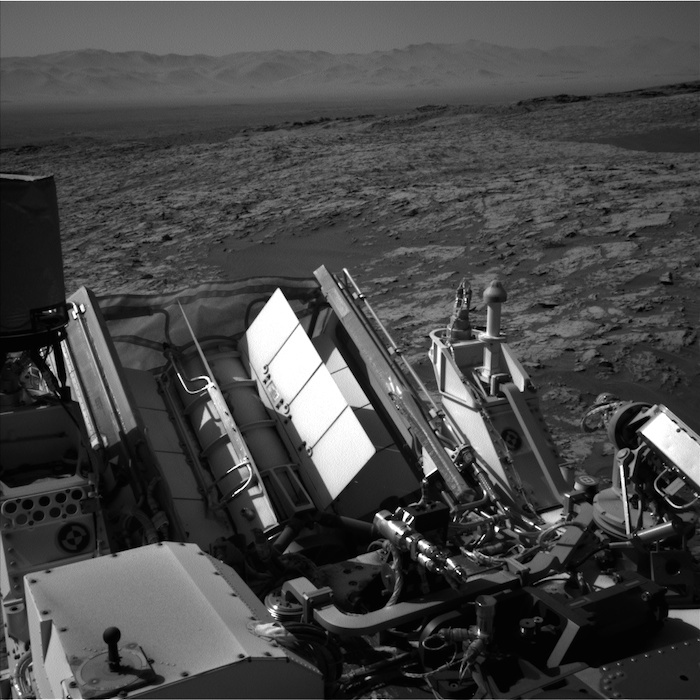 This image was taken by Navcam: Left B (NAV_LEFT_B) onboard NASA's Mars rover Curiosity on Sol 1181 (2015-12-02 14:32:09 UTC). 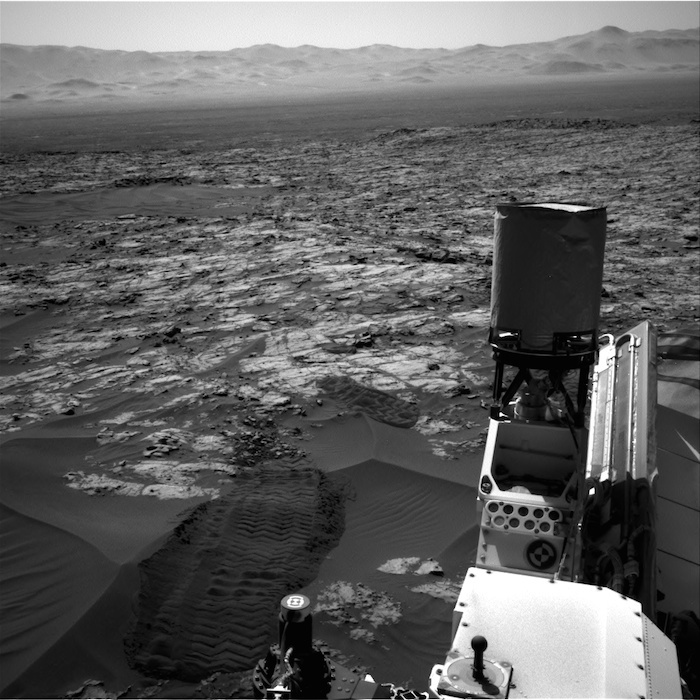 This image was taken by Rear Hazcam: Right B (RHAZ_RIGHT_B) onboard NASA's Mars rover Curiosity on Sol 1181 (2015-12-02 13:54:29 UTC). 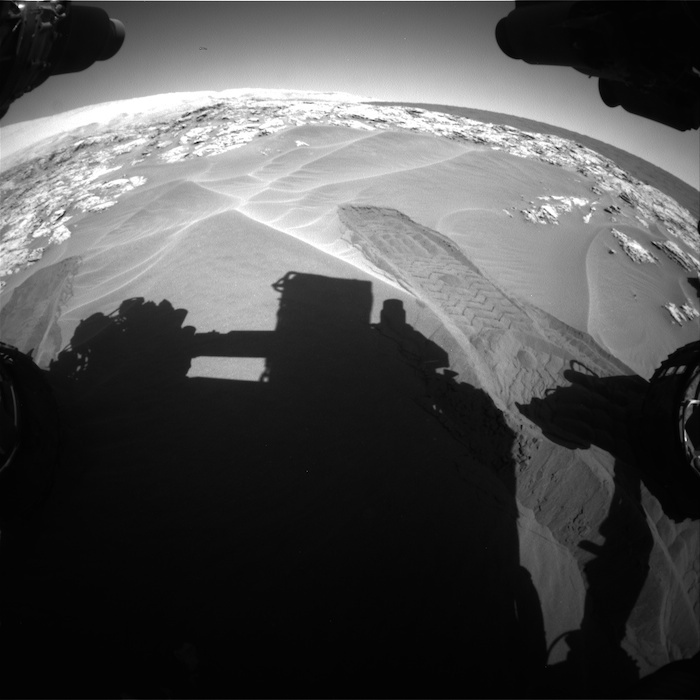 This image was taken by Rear Hazcam: Left B (RHAZ_LEFT_B) onboard NASA's Mars rover Curiosity on Sol 1181 (2015-12-02 14:18:56 UTC). This image was taken by Front Hazcam: Right B (FHAZ_RIGHT_B) onboard NASA's Mars rover Curiosity on Sol 1181 (2015-12-02 14:30:33 UTC). 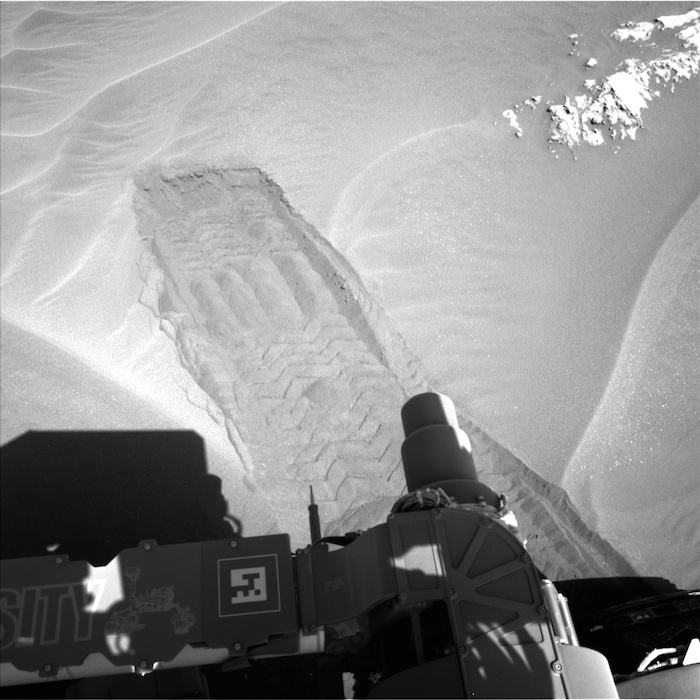 Curiosity performed the merge on December 3, 2015, Sol 1182 of the Mars Science Laboratory Mission, at 21:50:18 UTC. The focus motor count position was 12957. This number indicates the lens position of the first image that was merged. 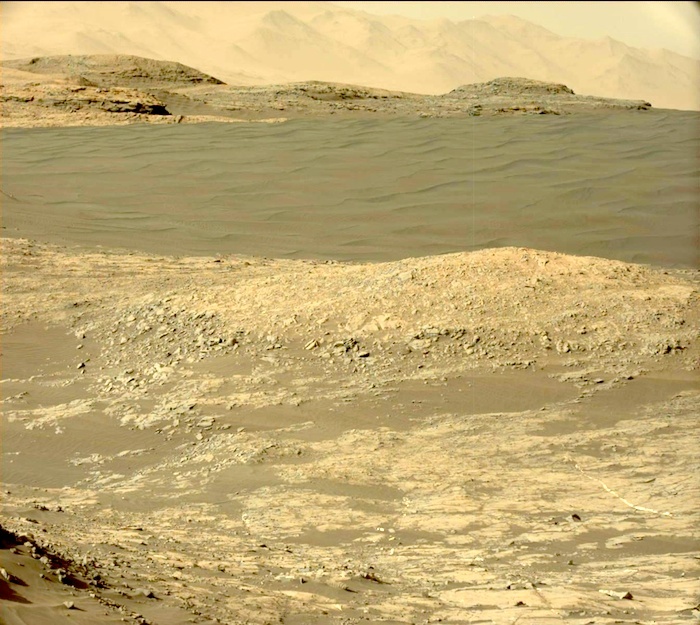 This image was taken by Mastcam: Right (MAST_RIGHT) onboard NASA's Mars rover Curiosity on Sol 1182 (2015-12-03 14:08:10 UTC). 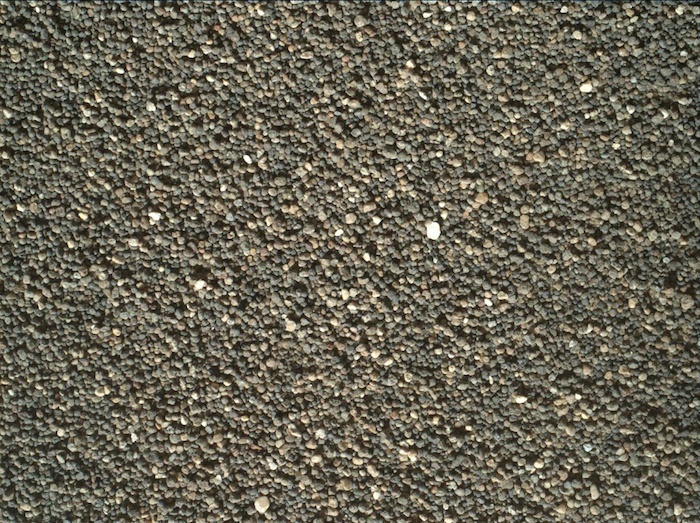 This image was taken by Front Hazcam: Right B (FHAZ_RIGHT_B) onboard NASA's Mars rover Curiosity on Sol 1182 (2015-12-03 18:32:37 UTC). 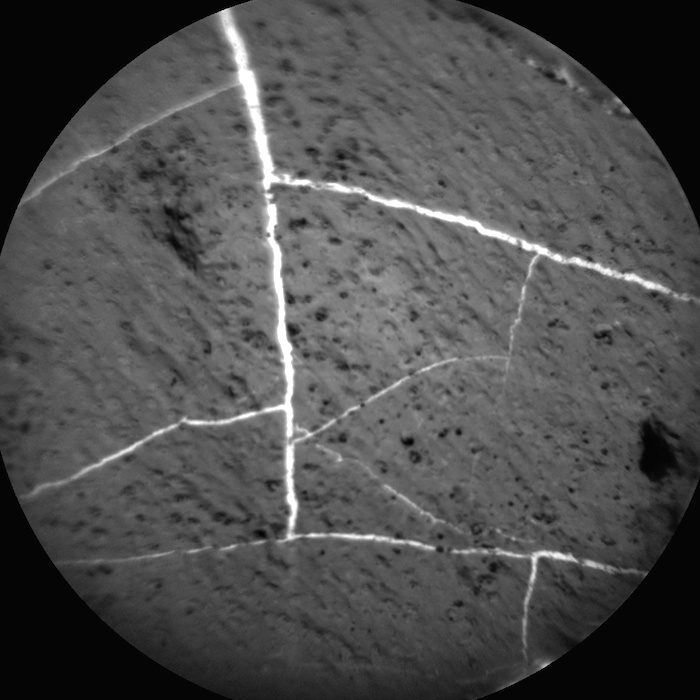 This image was taken by ChemCam: Remote Micro-Imager (CHEMCAM_RMI) onboard NASA's Mars rover Curiosity on Sol 1183 (2015-12-04 18:54:04 UTC). 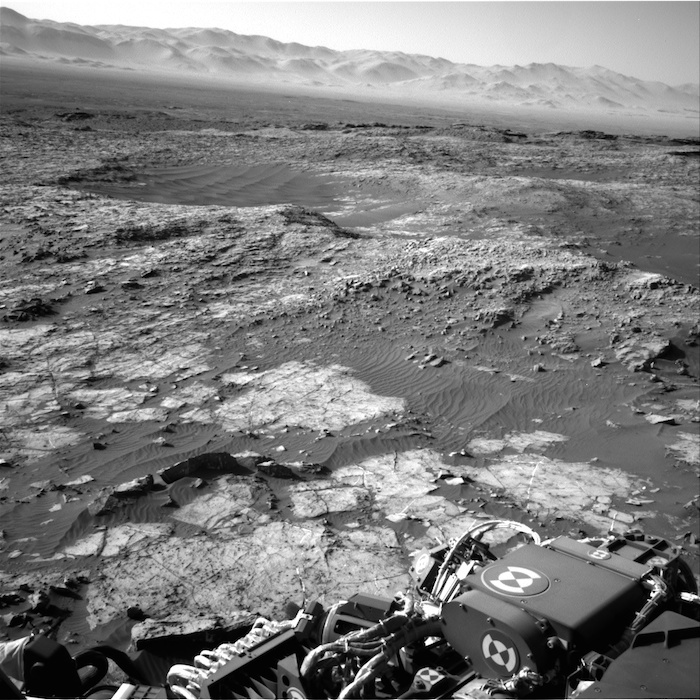 This image was taken by Navcam: Right B (NAV_RIGHT_B) onboard NASA's Mars rover Curiosity on Sol 1183 (2015-12-04 16:18:04 UTC). This image was taken by Front Hazcam: Right B (FHAZ_RIGHT_B) onboard NASA's Mars rover Curiosity on Sol 1183 (2015-12-04 15:27:53 UTC). 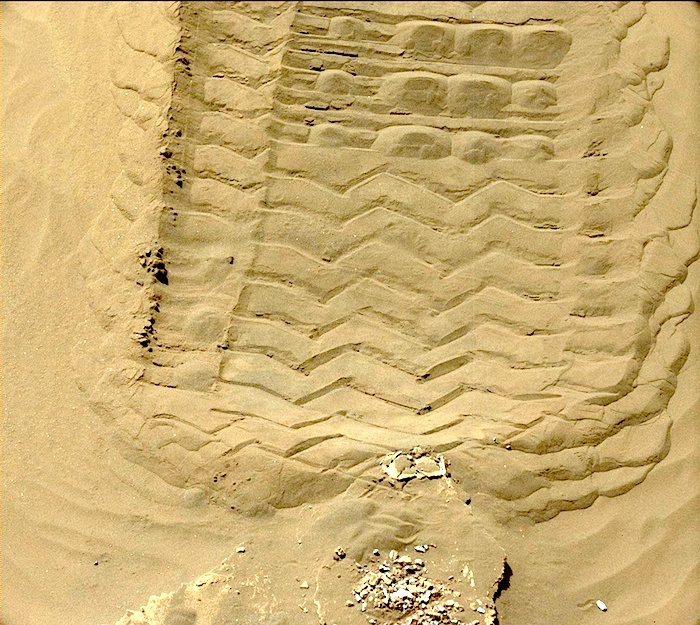 Curiosity performed the merge on December 6, 2015, Sol 1184 of the Mars Science Laboratory Mission, at 02:36:59 UTC. The focus motor count position was 14395. This number indicates the lens position of the first image that was merged. 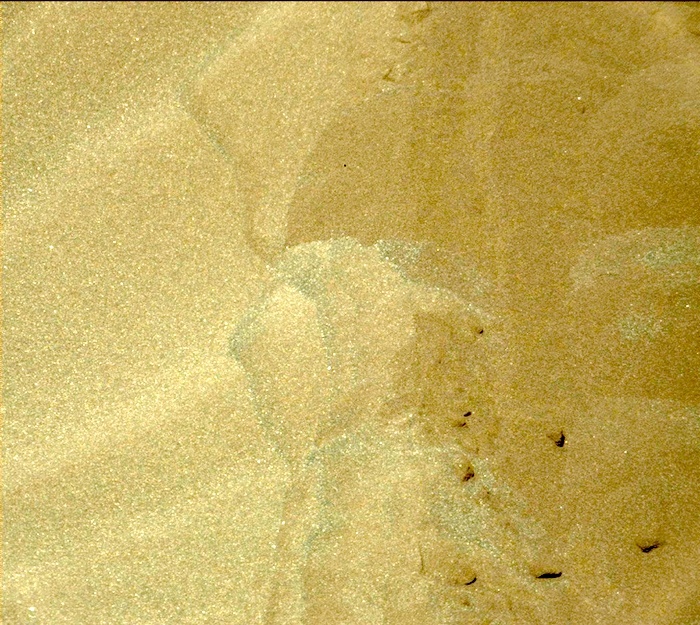 NASA's Mars rover Curiosity acquired this image using its Mars Hand Lens Imager (MAHLI), located on the turret at the end of the rover's robotic arm, on December 6, 2015, Sol 1184 of the Mars Science Laboratory Mission, at 01:24:43 UTC. When this image was obtained, the focus motor count position was 14258. This number indicates the internal position of the MAHLI lens at the time the image was acquired. This count also tells whether the dust cover was open or closed. Values between 0 and 6000 mean the dust cover was closed; values between 12500 and 16000 occur when the cover is open. 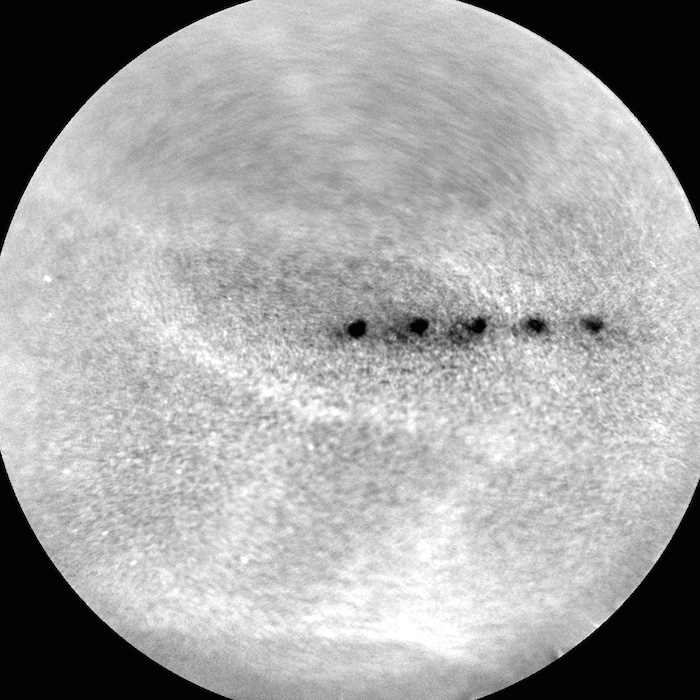 For close-up images, the motor count can in some cases be used to estimate the distance between the MAHLI lens and target. For example, in-focus images obtained with the dust cover open for which the lens was 2.5 cm from the target have a motor count near 15270. If the lens is 5 cm from the target, the motor count is near 14360; if 7 cm, 13980; 10 cm, 13635; 15 cm, 13325; 20 cm, 13155; 25 cm, 13050; 30 cm, 12970. These correspond to image scales, in micrometers per pixel, of about 16, 25, 32, 42, 60, 77, 95, and 113. 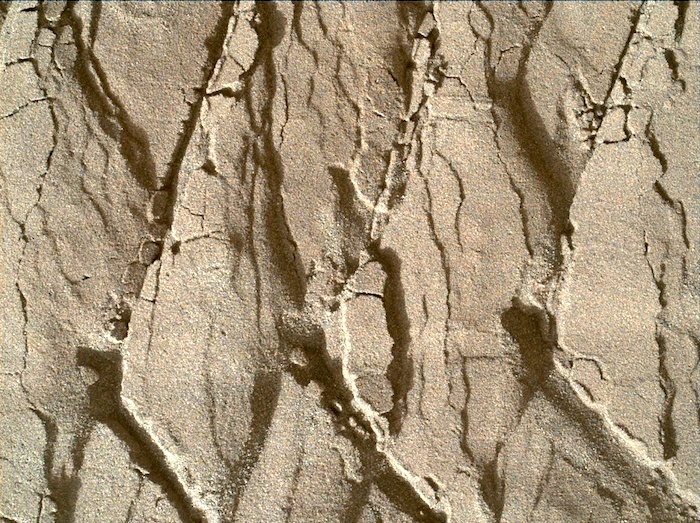 Most images acquired by MAHLI in daylight use the sun as an illumination source. However, in some cases, MAHLI's two groups of white light LEDs and one group of longwave ultraviolet (UV) LEDs might be used to illuminate targets. 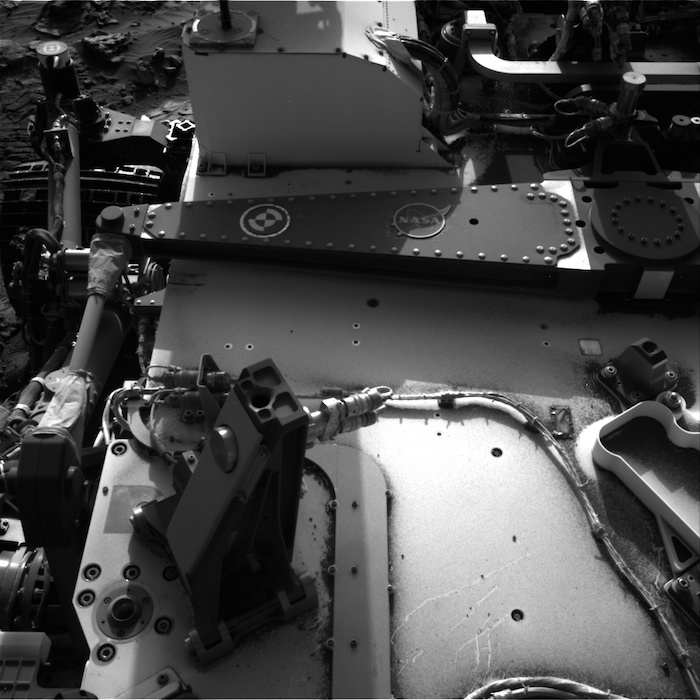 When Curiosity acquired this image, the group 1 white light LEDs were off, the group 2 white light LEDs were on, and the ultraviolet (UV) LEDS were off. 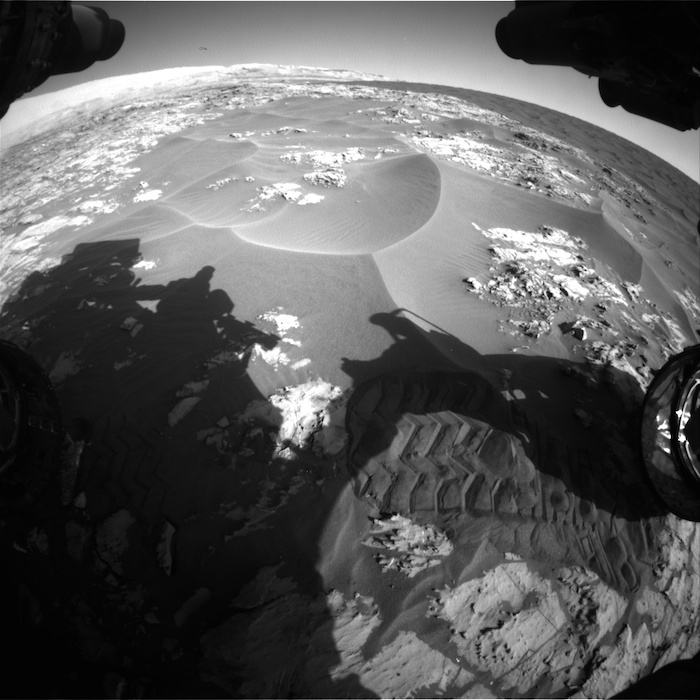 This image was taken by ChemCam: Remote Micro-Imager (CHEMCAM_RMI) onboard NASA's Mars rover Curiosity on Sol 1184 (2015-12-05 14:46:35 UTC). This image was taken by Front Hazcam: Right B (FHAZ_RIGHT_B) onboard NASA's Mars rover Curiosity on Sol 1184 (2015-12-05 19:16:53 UTC). 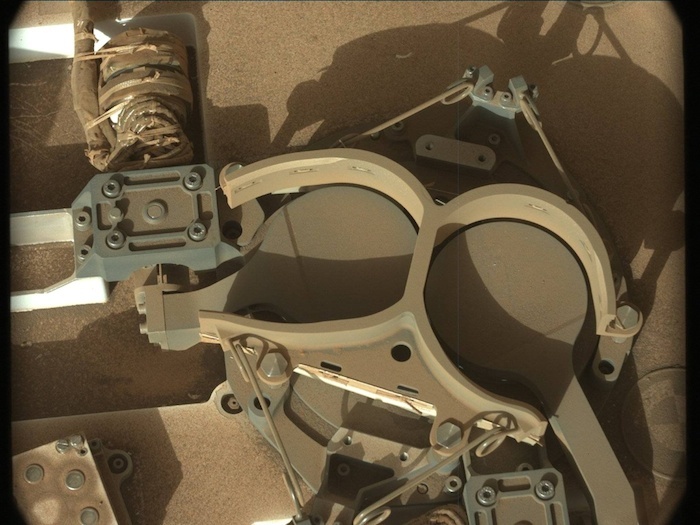 This image was taken by Mastcam: Left (MAST_LEFT) onboard NASA's Mars rover Curiosity on Sol 1185 (2015-12-06 19:29:08 UTC). 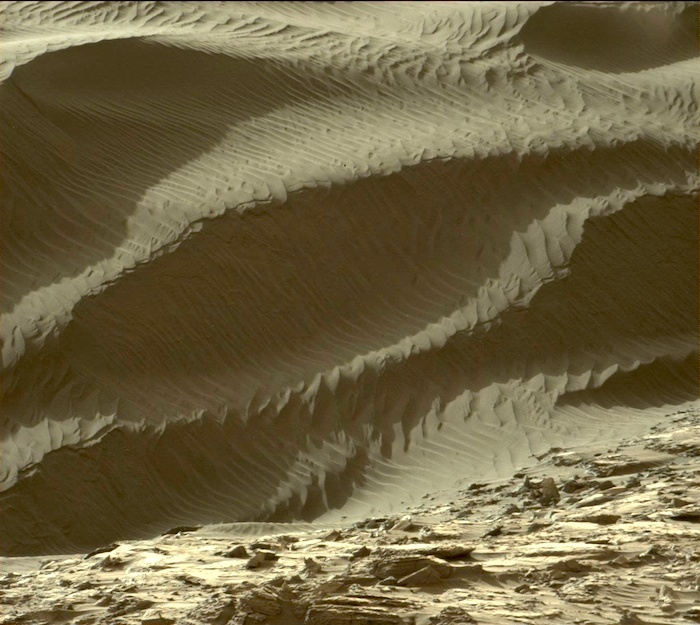 This image was taken by Mastcam: Left (MAST_LEFT) onboard NASA's Mars rover Curiosity on Sol 1185 (2015-12-06 19:29:25 UTC). 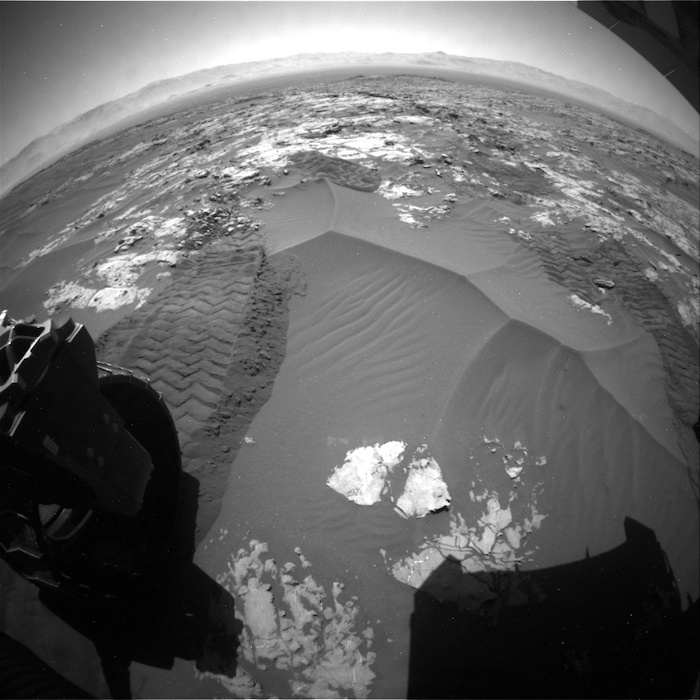 This image was taken by Navcam: Right B (NAV_RIGHT_B) onboard NASA's Mars rover Curiosity on Sol 1185 (2015-12-06 17:15:18 UTC). 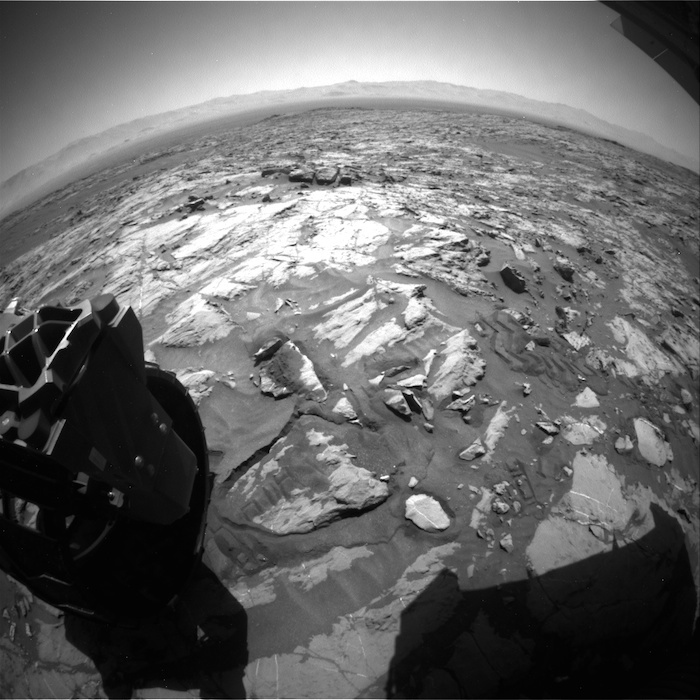 This image was taken by Navcam: Right B (NAV_RIGHT_B) onboard NASA's Mars rover Curiosity on Sol 1185 (2015-12-06 19:37:14 UTC). 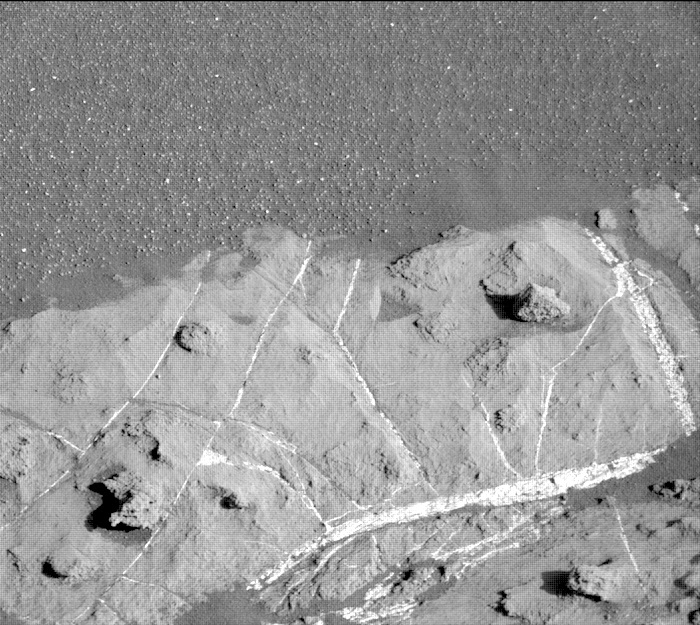 This image was taken by Navcam: Right B (NAV_RIGHT_B) onboard NASA's Mars rover Curiosity on Sol 1186 (2015-12-07 21:14:13 UTC). 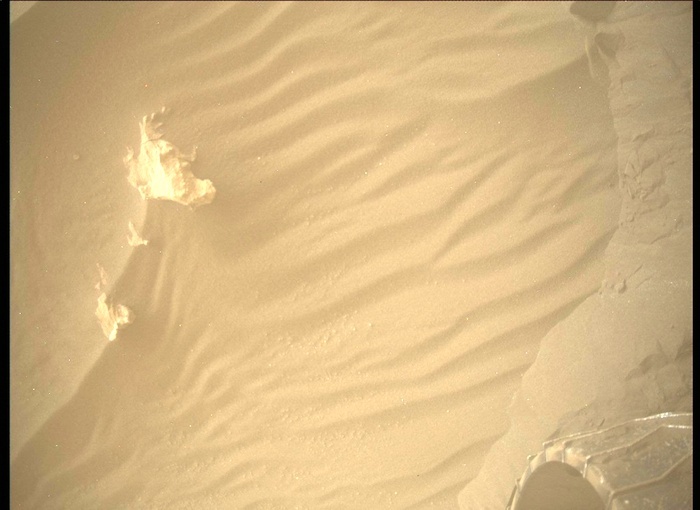 This image was taken by Mastcam: Right (MAST_RIGHT) onboard NASA's Mars rover Curiosity on Sol 1187 (2015-12-08 18:18:51 UTC). 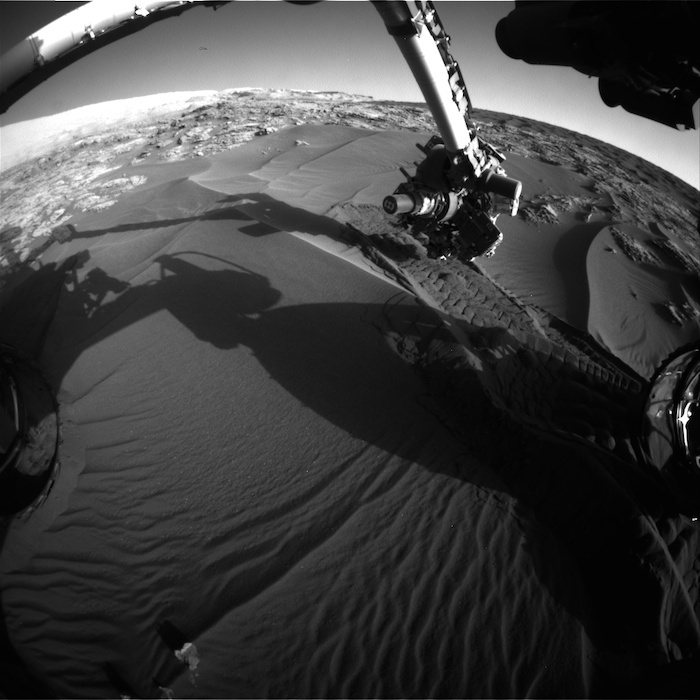 This image was taken by Navcam: Left B (NAV_LEFT_B) onboard NASA's Mars rover Curiosity on Sol 1187 (2015-12-08 21:04:51 UTC). 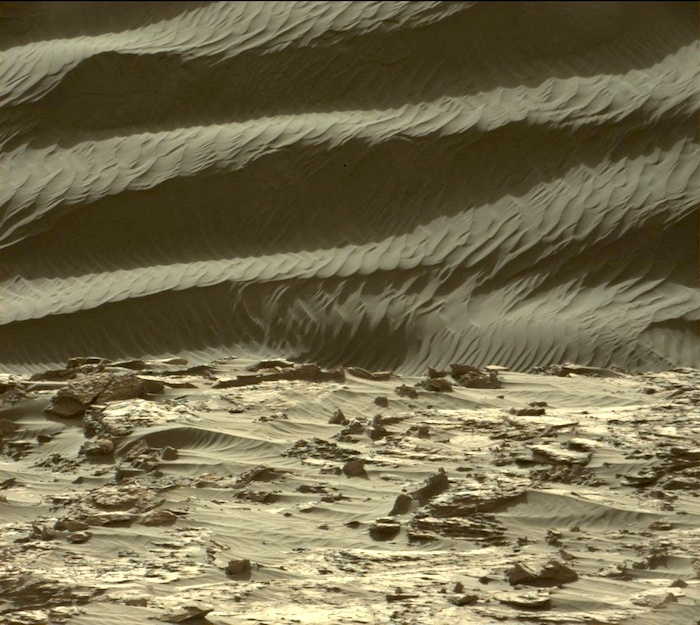 This image was taken by Mastcam: Right (MAST_RIGHT) onboard NASA's Mars rover Curiosity on Sol 1189 (2015-12-10 20:05:12 UTC). 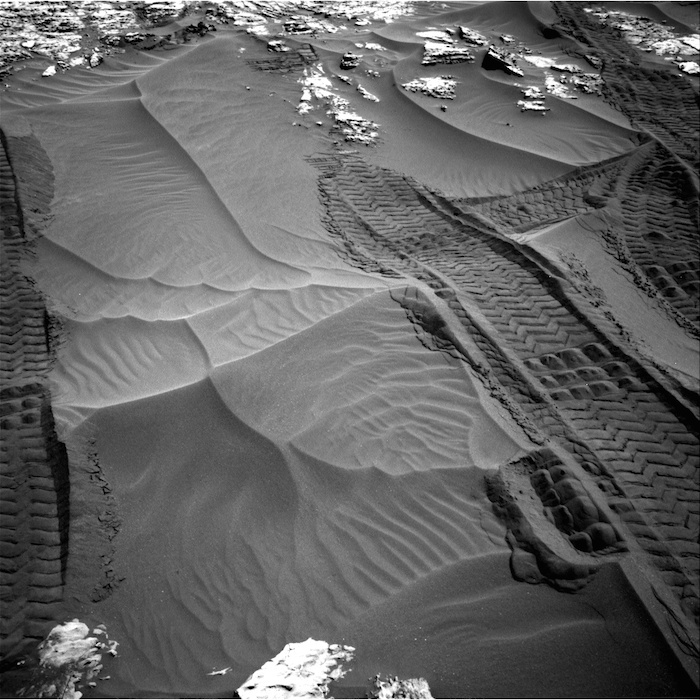 This image was taken by Mastcam: Right (MAST_RIGHT) onboard NASA's Mars rover Curiosity on Sol 1190 (2015-12-11 15:05:12 UTC). 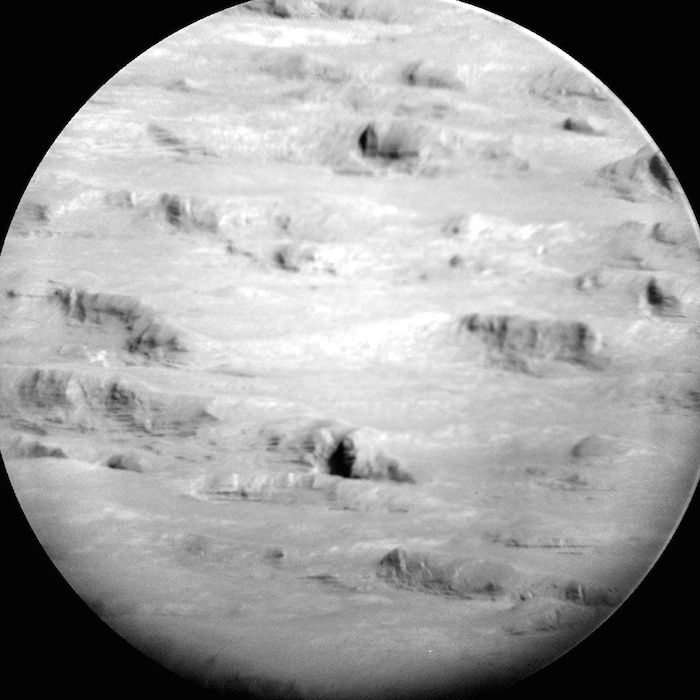 This image was taken by Mastcam: Right (MAST_RIGHT) onboard NASA's Mars rover Curiosity on Sol 1190 (2015-12-11 15:06:06 UTC). 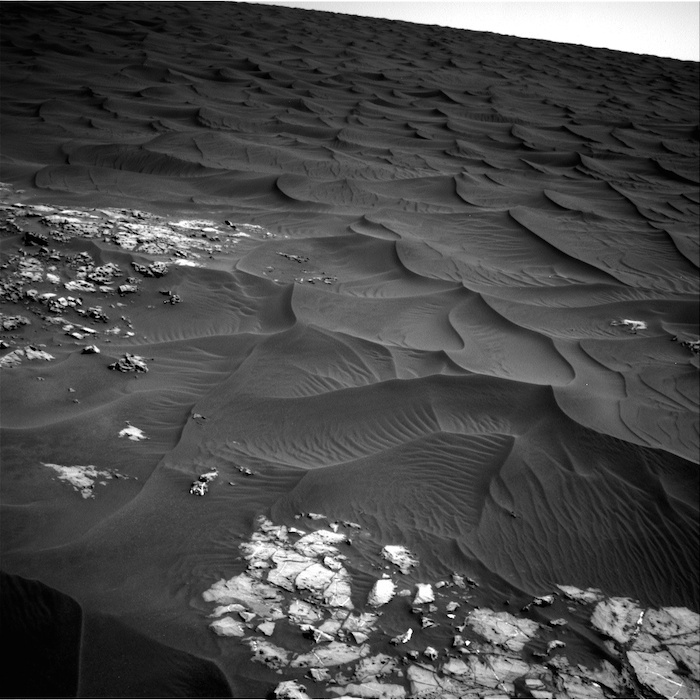 This image was taken by Mastcam: Right (MAST_RIGHT) onboard NASA's Mars rover Curiosity on Sol 1190 (2015-12-11 15:13:26 UTC). 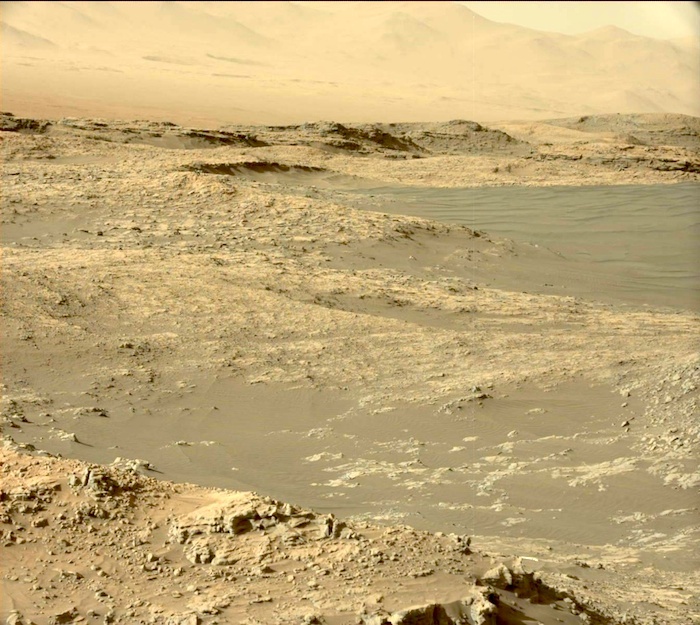 This image was taken by Mastcam: Right (MAST_RIGHT) onboard NASA's Mars rover Curiosity on Sol 1190 (2015-12-11 15:12:05 UTC).